The world’s largest nutrient recovery facility that improves water quality of the Chicago Area Waterway System while reducing downstream phosphorus discharges into the Gulf of Mexico has won a coveted Project Excellence Award from the Water Environment Federation (WEF). The honor will be presented to the project’s owner, the Metropolitan Water Reclamation District of Greater Chicago (MWRD); Black & Veatch, the facility’s design-builder; and technology provider, Ostara Nutrient Recovery Technologies. The project was instrumental in transitioning the largest wastewater treatment facility in the world —the MWRD’s Stickney Water Reclamation Plant, located in Cicero, Illinois — into a resource recovery facility. Using Ostara’s nutrient recovery technology, Black & Veatch worked with the MWRD and Ostara to design and build the nutrient recovery facility, which is reducing nutrient loads to the Chicago Sanitary and Ship Canal, Des Plaines River, Illinois River, and ultimately the Mississippi River and Gulf of Mexico. The differentiator with Ostara’s nutrient recovery solution implemented at the Stickney Water Reclamation Plant is that not only does it reduce phosphorus loads within the operational system of the plant by recovering these nutrients into a high value, marketable fertilizer, but nutrient loads are also reduced downstream into the Mississippi River to help address phosphorus deposits in the Gulf. Designed to treat up to 1.44 billion gallons of water each day and serving more than 2.3 million residents including the central part of Chicago and 46 suburban communities, the Stickney Water Reclamation Plant is pioneering this critical industry shift from water treatment to recovery for reuse. The award will be presented during WEF’s Annual Technical Exhibition and Conference (WEFTEC 2017), the world’s largest annual water quality conference and exhibition, Sept. 30-Oct. 4 in Chicago. Based in Alexandria, Virginia, WEF bestows the annual Project Excellence Award to outstanding programs and product execution in the water sector. Among other criteria, projects are evaluated on innovation, sustainability and community benefit. The award will be presented on Tuesday, Oct. 3, at WEFTEC 2017 in Chicago, Illinois. The fertilizer produced — Crystal Green® — is the first fertilizer technology to provide a continuous release of phosphorus, which is virtually water insoluble and uniquely Root-Activated™. Crystal Green releases nutrients only in response to organic acids (citrates) produced by growing roots, fertilizing plants on demand. This unique mode-of-action increases fertilizer efficiency and minimizes nutrient loss, significantly reducing leaching and runoff which further helps to protect the Chicago Area Waterway System from nutrient pollution. WEFTEC is recognized as the world’s largest annual water quality technical conference and exhibition, providing extensive educational opportunities and unparalleled access to the field’s most cutting edge technologies and services. The Black & Veatch-designed Groundwater Replenishment System (GWRS) Initial Expansion project in Orange County, CA, an alternative water supply system that bolsters water security for a large portion of Southern California, won a WEF Project Excellence Award in 2016. Ostara helps protect precious water resources by changing the way cities around the world manage nutrients in wastewater streams. The company’s Pearl® and WASSTRIP® technology recovers phosphorus and nitrogen at municipal and industrial wastewater treatment plants and transforms them into a high-value, eco-friendly fertilizer, Crystal Green®. The process greatly reduces nutrient management costs and helps plants meet increasingly stringent discharge limits while improving operating reliability. Crystal Green is the first continuous release granular fertilizer to provide Root-Activated™ phosphorus, nitrogen and magnesium (5-28-0 with 10%Mg), and is marketed globally to professionals in the agriculture, turf and horticulture sectors. 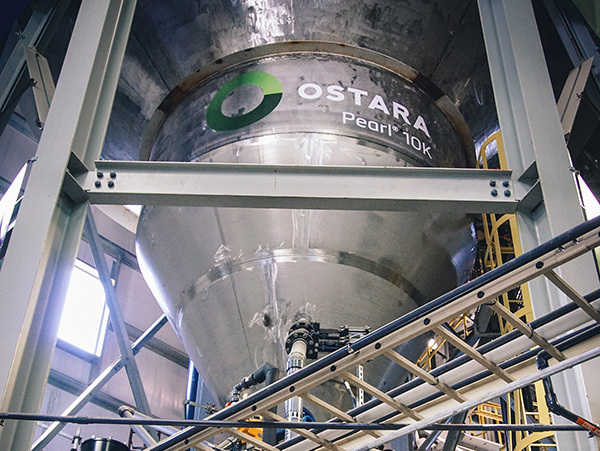 Ostara operates multiple facilities throughout North America and Europe and opened the world’s largest nutrient recovery facility in partnership with the Metropolitan Water Reclamation District (MWRD) of Greater Chicago in Spring 2016. For more information, visit www.ostara.com and www.crystalgreen.com. Established in 1889, the Metropolitan Water Reclamation District of Greater Chicago (www.mwrd.org) is an award-winning, special purpose government agency responsible for used water treatment and stormwater management in an 883.5 square mile service area in Cook County, Illinois. The MWRD’s mission is to protect the health and safety of the public in its service area, the quality of the water supply source (Lake Michigan), improve and protect the quality of water in watercourses, protect businesses and homes from flood damages, and manage water as a vital resource. The MWRD is committed to achieving the highest standards of excellence in fulfilling its mission. A designated Utility of the Future, the MWRD recovers resources that promote a clean and sustainable environment, provide a return to taxpayers and reduce greenhouse gas emissions through both tried and true practices as well as transformative technologies.